Beautiful 3 bedroom house in the Dordogne with private pool and gardens. 3 bedrooms 1 Bathroom with open plan living and dinning, conservatory/terrace. We purchased this property in January 2018. 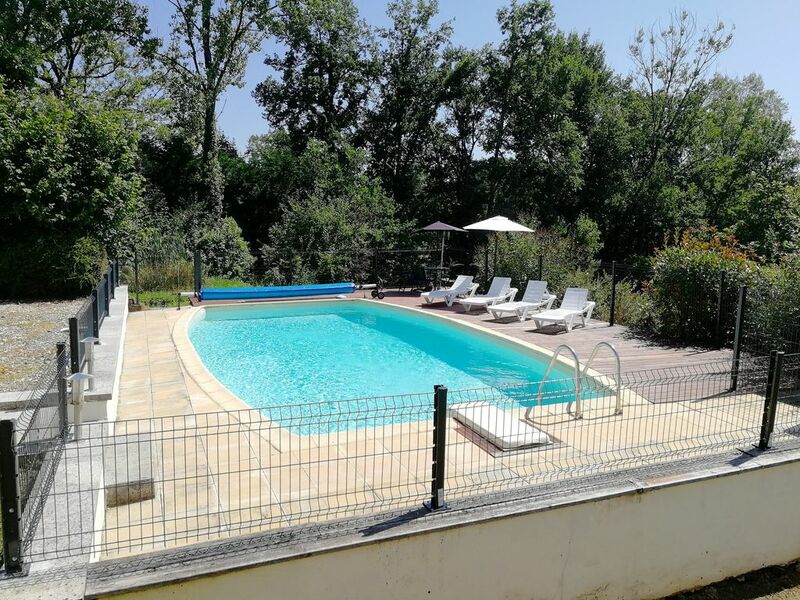 Semi detached 3 bedroom house with adjoining conservatory and roof top terrace and large private swimming pool situated in the stunning village of Saint Martin de Fressengeas, in the Dordogne region. The house consists of two double bedrooms with double beds. One twin bedroom with single bed and a rollaway single bed. The house also has a double sofa bed in the lounge area. All bedrooms have ample storage space. Open plan living, dinning and kitchen area with additional conservatory area off the living room. This leads to a rooftop terrace for 'al fresco' dining. Conservatory and terrace includes outside furniture. Modern kitchen consists of gas hob, electric oven, microwave, fridge, separate freezer, dishwasher and ample storage for a large family. Comfortable Lounge/Dinning area consists of three seater sofa and two seater bed sofa around a log burner that runs a cosy central heating system for the colder winter months. There are also supplementary electric heaters for cooler evenings in the summer. The large family bathroom consists of bath with shower over with 'his and hers' double vanity unit and WC. The property benefits from a 8mtr x 4mtr private swimming pool that is laid with a mix of patio stones and decking that is enclosed by a safety fence for those younger guests. Around the pool there are ample sun beds and a patio table and chairs with stunning views over the large private gardens and the rolling, unspoilt countryside. The quiet, friendly village of Saint Martin de Fressengeas has a small but well stocked shop. The shop incorporates a bakery or 'boulangerie' for the essential morning croissants. This is only a short walk of less than five minutes from the house. A further 5 min walk into the village you will find a small, cosy bar with a very friendly owner and the locals are extremely welcoming. A 15 min drive to the town of Thiviers you will find a range of amenities that include 3 supermarkets with a newly built large, well stocked Lidl. The town has bars, restaurants, shops, banks, post office and a mainline railway station. Riberac - famed for its Friday morning market selling local produce. Wander through the huge variety of stalls & then relax in one of the many cafe/bars & soak up the atmosphere. Grotte de Villars - the largest underground network in the Perigord, admire the frozen rivers, stalactites & stalagmites. Guided tours are provided with a sound & light show and it also offers a picnic area & a cafe. Bourdeilles - visit the medieval chateau in this ancient attractive village. The chateau is a 13th century fortress and a Renaissance residence. Aubeterre sur Dronne - another pretty village with wonderful views of the Dordogne countryside with the monolithic Eglise St Jean - carved out of the white chalky cliff. In the area there are a range of Grand Etangs (lakes for swimming some overseen by lifeguards) with sandy beaches. Enjoy your own lunch in the picnic area or treat yourself at the cafes. We really enjoyed our stay, being at the edge of the village meant very little traffic. If you are looking for somewhere away from the hustle and bustle of modern life, this is the place to go With WiFi and Freesat, although you are away from it all, you can still keep up if you choose. The pool is a good size and in a good place with seating, umbrellas and if you have young children, it has fencing around. The Village Bakery is a very short walk and has a few essentials as well as a range of daily baked baguettes etc. . Although it is located out in the countryside, there are a selection of supermarkets and restaurants a short drive away. A car would be essential. The house has been completed with everything that you'll need whilst you are there. As well as a full size fridge, there is a full size freezer, oven and hob.Very much a home from home. If you have any problems, there are local contact details for an English couple to call. Super séjour. Que tu bonheur au cœur du Périgord et à la campagne.